The Andean Condor (Vultur gryphus) is a species of South American bird in the New World vulture family Cathartidae and is the only member of the genus Vultur. Found in the Andes mountains and adjacent Pacific coasts of western South America, it has the largest wingspan (at 3.2 m or 10.5 ft) of any land bird. The condor is primarily a scavenger, feeding on carrion. It prefers large carcasses, such as those of deer or cattle. It reaches sexual maturity at five or six years of age and nests at elevations of up to 5,000 m (16,000 ft), generally on inaccessible rock ledges. One or two eggs are usually laid. It is one of the world's longest-living birds, with a lifespan of up to 100 years old in captivity. The Andean Condor is a national symbol of Peru, Argentina, Bolivia, Chile, Colombia, and Ecuador, and plays an important role in the folklore and mythology of the Andean regions. The Andean Condor is considered near threatened by the IUCN. It is threatened by habitat loss and by secondary poisoning from carcasses killed by hunters. Captive breeding programs have been instituted in several countries. The Andean Condor was described by Carl Linnaeus in 1758 in the tenth edition of his Systema Naturae and retains its original binomial name of Vultur gryphus. The Andean Condor is sometimes called the Argentinean Condor, Bolivian Condor, Chilean Condor, Colombian Condor, Ecuadorian Condor, or Peruvian Condor after one of the nations to which it is native. The generic term Vultur is directly taken from the Latin vultur or voltur, which means "vulture". Its specific epithet is derived from a variant of the Greek word γρυπός (grupós, "hook-nosed"). The word condor itself is derived from the Quechua kuntur. The exact taxonomic placement of the Andean Condor and the remaining six species of New World Vultures remains unclear. Though both are similar in appearance and have similar ecological roles, the New World and Old World Vultures evolved from different ancestors in different parts of the world and are not closely related. Just how different the two families are is currently under debate, with some earlier authorities suggesting that the New World vultures are more closely related to storks. More recent authorities maintain their overall position in the order Falconiformes along with the Old World Vultures or place them in their own order, Cathartiformes. The South American Classification Committee has removed the New World Vultures from Ciconiiformes and instead described them as incertae sedis, but notes that a move to Falconiformes or Cathartiformes is possible. Although it is on average about seven to eight cm shorter from beak to tail than the California Condor, the Andean Condor is larger in wingspan, which ranges from 270 to 320 cm (8.9 to 10.5 ft). It is also typically heavier, reaching a weight of 11 to 15 kg (24 to 33 lb) for males and 6 to 14 kg (13 to 31 lb) for females. Overall length can range from 100 to 135 cm (39 to 53 in). Measurements are usually taken from specimens reared in captivity. The mean weight is 10.7 kg (24 lb) and this is second only to the Dalmatian Pelican as the heaviest average weight for a flying bird and places the species as the heaviest land bird on average (although male bustards can weigh more). The adult plumage is a uniform black, with the exception of a frill of white feathers nearly surrounding the base of the neck and, especially in the male, large patches or bands of white on the wings which do not appear until the completion of the bird's first molting. 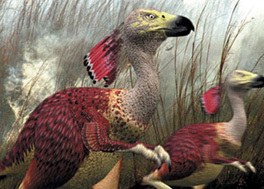 The head and neck are red to blackish-red and have few feathers. The head and neck are meticulously kept clean by the bird, and their baldness is an adaptation for hygiene, allowing the skin to be exposed to the sterilizing effects of dehydration and ultraviolet light at high altitudes. The crown of the head is flattened. In the male, the head is crowned with a dark red caruncle or comb, while the skin of his neck lies in folds, forming a wattle. The skin of the head and neck is capable of flushing noticeably in response to emotional state, which serves to communicate between individuals. Juveniles have a grayish-brown general coloration, blackish head and neck skin, and a brown ruff. The middle toe is greatly elongated, and the hind one is only slightly developed, while the talons of all the toes are comparatively straight and blunt. The feet are thus more adapted to walking, and are of little use as weapons or organs of prehension as in birds of prey and Old World vultures. The beak is hooked, and adapted to tear rotting meat. The irises of the male are brown, while those of the female are deep red. The eyelids lack eyelashes. Contrary to the usual rule for sexual dimorphism among birds of prey, the female is smaller than the male. The Andean Condor is found in South America in the Andes, including the Santa Marta Mountains. 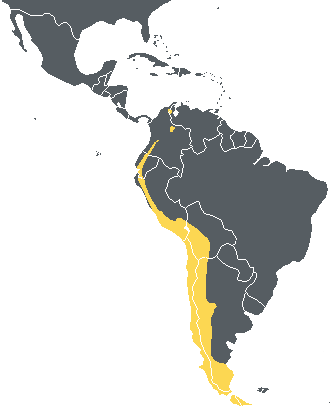 In the north, its range begins in Venezuela and Colombia, where it is extremely rare, then continues south along the Andes in Ecuador, Peru, and Chile, through Bolivia and western Argentina to the Tierra del Fuego. In the early nineteenth century, the Andean Condor bred from western Venezuela to Tierra del Fuego, along the entire chain of the Andes, but its range has been greatly reduced due to human activity. Its habitat is mainly composed of open grasslands and alpine areas up to 5,000 m (16,000 ft) in elevation. It prefers relatively open, non-forested areas which allow it to spot carrion from the air, such as the páramo or rocky, mountainous areas in general. It occasionally ranges to lowlands in eastern Bolivia and southwestern Brazil, descends to lowland desert areas in Chile and Peru, and is found over southern-beech forests in Patagonia. The condor soars with its wings held horizontally and its primary feathers bent upwards at the tips. The lack of a large sternum to anchor its correspondingly large flight muscles physiologically identifies it as primarily being a soarer. It flaps its wings on rising from the ground, but after attaining a moderate elevation it flaps its wings very rarely, relying on thermals to stay aloft. Charles Darwin commented on having watched them for half an hour without once observing a flap of their wings. It prefers to roost on high places from which it can launch without major wing-flapping effort. Andean Condors are often seen soaring near rock cliffs, using the heat thermals to aid them in rising in the air. Like other New World Vultures, the Andean Condor has the unusual habit of urohidrosis: it often empties it's cloaca onto its legs and feet. A cooling effect through evaporation has been proposed as a reason for this behaviour, but it makes no sense in the cold Andean habitat of the bird. Because of this habit, their legs are often streaked with a white buildup of uric acid. The Andean Condor is a scavenger, feeding mainly on carrion. Wild condors inhabit large territories, often traveling more than 200 km (120 mi) a day in search of carrion. In inland areas, they prefer large carcasses, such as those of dead farm animals or wild deer, while their diet consists mainly of beached carcasses of marine mammals when near the coast. They will also raid the nests of smaller birds to feed on the eggs. Coastal areas provide a constant food supply, and in particularly plentiful areas, some Andean Condors limit their foraging area to several kilometers of beach-front land. They locate carrion by spotting it or by following other scavengers, such as corvids or other vultures. It may follow New World Vultures of the genus Cathartes—the Turkey Vulture, the Lesser Yellow-headed Vulture, and the Greater Yellow-headed Vulture—to carcasses. The Cathartes vultures forage by smell, detecting the scent of ethyl mercaptan, a gas produced by the beginnings of decay in dead animals. These smaller vultures cannot rip through the tougher hides of these larger animals with the efficiency of the larger condor, and their interactions are often an example of mutual dependence between species. Black Vultures, King Vultures and even mammalian scavengers may sometimes track Cathartes vultures for carcasses but the condor is invariably dominant among the scavengers in its range. Andean Condors are intermittent eaters in the wild, often going for a few days without eating, then gorging themselves on several pounds at once, sometimes to the point of being unable to lift off the ground. Because its feet and talons are not adapted to grasping, it must feed while on the ground. Like other carrion-feeders, it plays an important role in its ecosystem by disposing of carrion which would otherwise be a breeding ground for disease. Sexual maturity and breeding behavior do not appear in the Andean Condor until the bird is five or six years of age. It may live to be 50 plus, and it mates for life. During courtship displays, the skin of the male's neck flushes, changing from dull red to bright yellow, and inflates. He approaches the female with neck outstretched, revealing the inflated neck and the chest patch, while hissing, then extends his wings and stands erect while clicking his tongue. Other courtship rituals include hissing and clucking while hopping with wings partially spread, and dancing. The Andean condor prefers to roost and breed at elevations of 3,000 to 5,000 m (9,800 to 16,000 ft). Its nest, which consists of a few sticks placed around the eggs, is created on inaccessible ledges of rock. However, in coastal areas of Peru, where there are few cliffs, some nests are simply partially shaded crannies scraped out against boulders on slopes. It deposits one or two bluish-white eggs, weighing about 280 g (9.9 oz) and ranging from 75 to 100 mm (3.0 to 3.9 in) in length, during the months of February and March every second year. The egg hatches after 54 to 58 days of incubation by both parents. If the chick or egg is lost or removed, another egg is laid to take its place. Researchers and breeders take advantage of this behavior to double the reproductive rate by taking the first egg away for hand-rearing, causing the parents to lay a second egg, which they are generally allowed to raise. 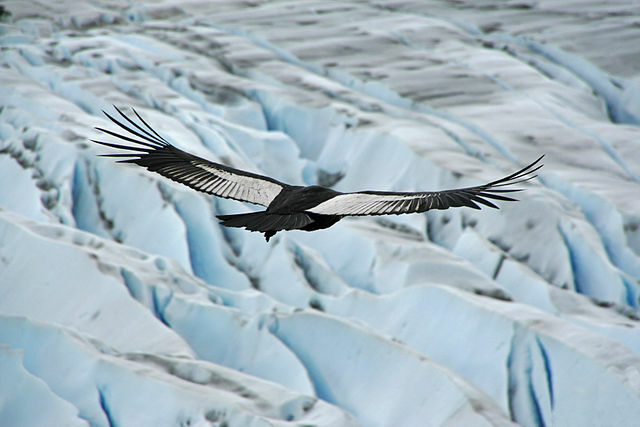 The Andean Condor is considered near threatened by the IUCN. It was first placed on the United States Endangered Species list in 1970, a status which is assigned to an animal that is in danger of extinction throughout all or a significant portion of its range. Threats to its population include loss of habitat needed for foraging and secondary poisoning from animals killed by hunters. It is threatened mainly in the northern area of its range, and is extremely rare in Venezuela and Colombia, where it has undergone considerable declines in recent years. Because it is adapted to very low mortality and has correspondingly low reproductive rates, it is extremely vulnerable to human persecution, most of which stems from the fact that it is perceived as a threat by farmers due to alleged attacks on livestock. Education programs have been implemented by conservationists to dispel this misconception. Reintroduction programs using captive-bred Andean Condors, which release birds hatched in North American zoos into the wild to bolster populations, have been introduced in Argentina, Venezuela, and Colombia. The first captive-bred Andean Condors were released into the wild in 1989. When raising condors, human contact is minimal; chicks are fed with glove puppets which resemble adult Andean Condors in order to prevent the chicks from imprinting on humans, which would endanger them upon release as they would not be wary of humans. The condors are kept in aviaries for three months prior to release, where they acclimatize to an environment similar to that which they will be released in. Released condors are tracked by satellite in order to observe their movements and to monitor whether they are still alive. In response to the capture of all the wild individuals of the California Condor, in 1988 the US Fish and Wildlife Service began a reintroduction experiment involving the release of captive Andean Condors into the wild in California. Only females were released to eliminate the possibility of accidentally introducing a South American species into the United States. The experiment was a success, and all the Andean Condors were recaptured and re-released in South America before the reintroduction of the California Condors took place. The Andean Condor is often seen in captivity. Cali Zoo and San Diego Zoo have together released over 20 condors that were raised in captivity. The Andean Condor is a national symbol of Argentina, Bolivia, Chile, Colombia, Ecuador and Peru. It is the national bird of Bolivia, Chile, Colombia, and Ecuador. It plays an important role in the folklore and mythology of the South American Andean regions, and has been represented in Andean art from c. 2500 BCE onward, and they are a part of indigenous Andean religions. In Andean mythology, the Andean Condor was associated with the sun deity, and was believed to be the ruler of the upper world. The Andean Condor is considered a symbol of power and health by many Andean cultures, and it was believed that the bones and organs of the Andean Condor possessed medicinal powers, sometimes leading to the hunting and killing of condors to obtain its bones and organs. In some versions of Peruvian bullfighting, a condor is tied to the back of a bull, where it pecks at the animal as bullfighters fight it. The condor generally survives and is set free. In Peru, they are commonly shot. There is also a ceremony known as the arranque del condor in which a live Andean Condor is suspended from a frame and is punched to death by horsemen as they ride by.